We appreciate your interest, and invite you to explore the numerous research opportunities available with our Department. Below are a few highlights to get you started. In 2018, we ranked 4th best in NIH funding among all Biochemistry Departments in the nation, securing over $19.2 million in funding from the NIH, and 2nd among public institutions. Six of our faculty (Ronald Swanstrom, Aziz Sancar, Brian A. Kuhlman, Dale A. Ramsden, William F. Marzluff, and Jean G. Cook) ranked in the top 130 of most highly funded NIH investigators in 2018. Of special note is that Ronald Swanstrom ranked seventh among all principal investigators in Biochemistry for total NIH dollars.Our faculty, consisting of 28 primary, 14 research track, 12 joint and 7 adjunct faculty members, are highly distinguished and internationally recognized. In recent years, Aziz Sancar was awarded the 2015 Noble Prize in Chemistry, and along with Richard Wolfenden and Jack D. Griffith, was also elected into the National Academy of Sciences. In addition, many of our faculty members have received international recognition and awards for their research and accomplishments. Thus, the department has created a vibrant and productive training environment for graduate students seeking their doctoral degrees. We have a large and vibrant PhD program with more than 70 students from all over the United States and around the world. After their first year in the Biological and Biomedical Sciences Program (BBSP), students can matriculate directly to the Biochemistry & Biophysics graduate program, as well as to one of several interdisciplinary training programs. Students interested in our Biochemistry Track can design a flexible program that potentially exposes them to current research in biochemical, molecular, cell biological and biophyscial concepts. They can also apply to one of many training grants appropriate to their area of interest. For the Biophysics Track, the Molecular & Cellular Biophysics Predoctoral Training Program affords participating students the opportunity to work with faculty in eleven UNC departments, including Physics, Chemistry, Computer Sciences, Applied Mathematics and Medicinal Chemistry. The aim of this program is to apply mechanistic and quantitative approaches to medically significant problems. Students who are specifically interested in biophysics may wish to apply to this program as well, particularly if they would like to take full advantage of the biophysics training curriculum or wish to have the option of working with biophysics faculty in departments other than Biochemistry & Biophysics. The department has broad research strengths, but with particular emphasis in four areas: 1) chromatin biochemistry, DNA processes including replication, repair, recombination, remodeling and transcription; 2) cell signaling and cell cycle control, trafficking and retroviruses; 3) enzymology, protein biochemistry and biophysics and, 4) proteomic, structural and computational biology. 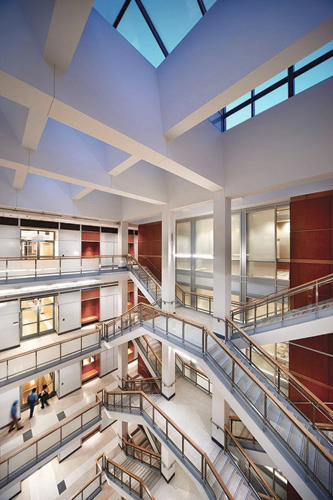 UNC has an exceptionally strong research infrastructure with a wide range of core facilities, including outstanding resources in structural bioinformatics, microscopy, functional genomics, macromolecular interactions, as well as proteomics and mass spectrometry. Our department members specifically oversee the following cores: Structural Bioinformatics Core, NMR Spectroscopy Lab, the Macromolecular Interactions Facility, and a new High Throughput Peptide Synthesis and Array Facility.